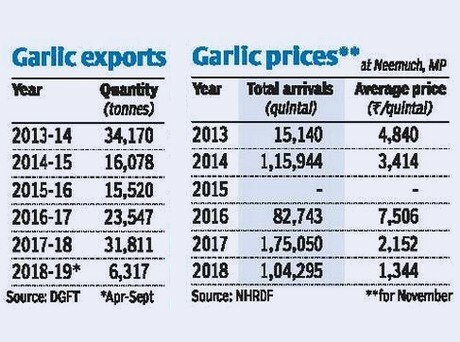 Across India, rising supplies and falling exports have dragged garlic prices to a five-year low. At the Neemuch market in Madhya Pradesh, prices tumbled to as low as ₹250 (€3.12) a 100 kg, with the modal price at ₹1,000 (€12.46) for December 4. Arrivals hover around 1,580 tons. Traders attribute the fall in prices to increased supplies. Exports have also taken a hit as the competing Chinese crop reportedly grabbed the markets in the US, Europe, the Gulf region and South Asia. Farmers, on the other hand, are disappointed with the lack of government support to boost exports. “The government should have given export assistance to ease the supply pressure. Farmers have incurred huge losses. They are still holding on to at least two months’ stocks,” said Narayansinhji Rathod, a farmer's representative. In 2016-17, over 1.69 million tons of garlic were produced from 320,000 hectares, with an average yield of 5.28 tons per hectare. However, farmers in Madhya Pradesh are better off as the State government extended the benefit of price differential scheme — Bhawantar Bhugtan Yojana — for the garlic crop as well. “A section of farmers benefited from this but the returns could have been better if exports were encouraged,” said Rathod. In Gujarat and Rajasthan, the two leading garlic-producing regions, the crops remain with the farmers, who are waiting for better prices. NHRDF officials said the farmers got lured by attractive prices for the bulb the previous year. This prompted them to grow more garlic — much more than the domestic requirement. The situation turned adversely after disappointing exports. “The international market is very competitive and due to better quality and attractive prices, Chinese garlic gets preference. This added to the domestic supplies,” said an official.